Parity games are abstract infinite-round games that take an important role in formal verification. In the basic setting, these games are two-player, turn-based, and played under perfect information on directed graphs, whose nodes are labeled with priorities. The winner of a play is determined according to the parities (even or odd) of the minimal priority occurring infinitely often in that play. The problem of finding a winning strategy in parity games is known to be in UPTime \(\cap \) CoUPTime and deciding whether a polynomial time solution exists is a long-standing open question. In the last two decades, a variety of algorithms have been proposed. Many of them have been also implemented in a platform named PGSolver. This has enabled an empirical evaluation of these algorithms and a better understanding of their relative merits. 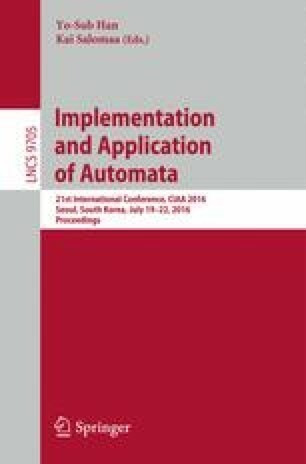 In this paper, we further contribute to this subject by implementing, for the first time, an algorithm based on alternating automata. More precisely, we consider an algorithm introduced by Kupferman and Vardi that solves a parity game by solving the emptiness problem of a corresponding alternating parity automaton. Our empirical evaluation demonstrates that this algorithm outperforms other algorithms when the game has a small number of priorities relative to the size of the game. In many concrete applications, we do indeed end up with parity games where the number of priorities is relatively small. This makes the new algorithm quite useful in practice. Work supported by NSF grants CCF-1319459 and IIS-1527668, NSF Expeditions in Computing project “ExCAPE: Expeditions in Computer Augmented Program Engineering”, BSF grant 9800096, ERC Advanced Investigator Grant 291528 (“Race”) at Oxford and GNCS 2016: Logica, Automi e Giochi per Sistemi Auto-adattivi. G. Perelli—Part of the work has been done while visiting Rice University.